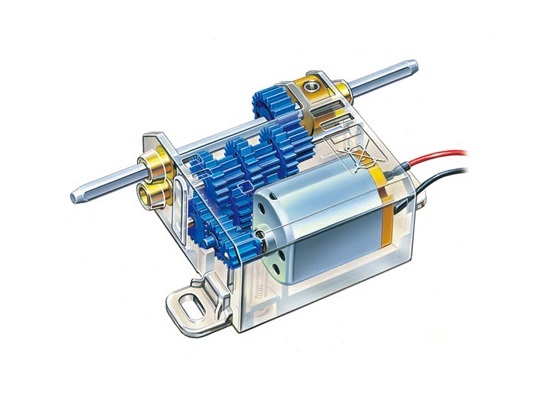 A cheap and more readily available alternative to the Siku Control 32 motors is the wide range of motors and gearboxes produced by Tamiya. Tamiya have a long history of manufacturing models including radio controlled cars and as a result they have produced a lot of motors. Unlike most companies in this field they actively promote building your own vehicles using their parts as not only do the sell the motors, they also expansion kits like extended axles. The majority of the Tamiya motors which will fit in a 1:32 scale RC tractor use plastic gears which means there is a higher probability of damaging the gearbox than with the Siku motor. On the other hand you can usually adjust the gear ratio relatively easily which means you can chose to go slower with more pulling power or faster with less pulling power.